This "house-tarter sauce" or Remoulade is the perfect accompaniment for breaded fish, crab cakes, or as the mix for a killer tuna salad. Recipe by Executive Chef Spencer Vail,Benmiller Inn and Spa. (Sugar & Water) - bring to a boil to make a syrup then remove from heat. Let the liquid cool before adding it to your tartar sauce. This recipe will make enough aioli to make your tartar sauce and fill a large mason jar to use for dips or on sandwiches. Your neutral aioli should easily last 2 weeks under refrigeration in a clean, sealed container. It is easiest to make with the help of a stand mixer or food processor, but a hand blender or good old-fashioned whisk will work too. 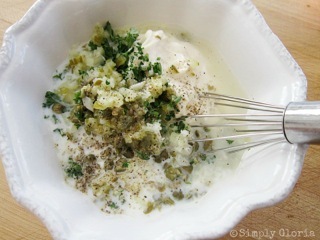 Combine egg yolks, 1/4 cup water & grainy mustard in mixer with whisk attachment or a food processor. Keep motor running while adding. Add oil slowly in a thin steady stream. This instruction is important: if you add the oil fast your mixture will not emulsify and instead of creamy mayonnaise you will have a chunky looking oily mess! Use water to thin the viscosity of the emulsion if it is getting too thick. Finish your sauce by whisking in the white pepper, lemon juice & salt until combined. If your "mayonnaise" is too thick, you can thin it out with a little bit of cold water. If it is too thin, you can add more oil. - Make sure all ingredients and utensils are cold. If the mixture get too warm, it will "split" back into oil and water. - If you are suing a food processor, try to drip the oil right onto the spinning blade. Some machines come with an attachment that will only allow a thin stream of oil to drip through into the mixture, which is ideal. - If you are using a whisk, only add some of the water from step one at first. You will only be adding oil a few drops at a time until the egg yolks have started to emulsify. Place a damp towel under your mixing bowl so it won't move around on you too much and whisk quickly.